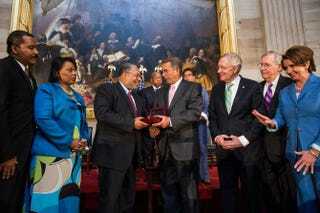 Dexter Scott King and Bernice King look on as Speaker of the House John Boehner (R-Ohio) presents Lonnie Bunch, founding director of the Smithsonian National Museum of African American History and Culture, with the Congressional Gold Medal on behalf of the Rev. Martin Luther King Jr. and Coretta Scott King on Capitol Hill June 24, 2014, in Washington, D.C. Looking on next to Boehner are Senate Majority Leader Harry Reid (D-Nev.), Senate Minority Leader Mitch McConnell (R-Ky.) and House Minority Leader Nancy Pelosi (D-Calif.). Former President Jimmy Carter has been tapped to mediate the ongoing legal battle among the three living children of the Rev. Martin Luther King Jr., who are at odds over whether to sell the civil rights icon's traveling Bible and 1964 Nobel Peace Prize, the Associated Press reports. Last year MLK's estate, which is controlled by his two sons, Martin Luther King III and Dexter Scott King, asked a judge to order their sister to surrender the two artifacts. Martin Luther King III and Dexter Scott King voted 2-1, against Bernice King, to sell the two items to a private buyer during a board of directors meeting last year. Bernice King is adamant that her father's cherished possessions should remain in the family. Lawyers for both sides told Fulton County, Ga., Superior Court Judge Robert McBurney that they were close to an agreement last year. McBurney issued an order for an arbitrator in response to a request from Bernice King's lawyer for mediation, to which the estate's lawyer had no objection. "I am honored to be working with the King Family in an effort to resolve the outstanding legal issues relating to their remarkable family legacy," Carter said in a statement released Monday. "I have great respect for each of the three heirs of this legacy. They are working diligently with me, and I believe we will be able to resolve these difficult disputes once and for all." The 91-year-old former president recently disclosed that he has cancer, which has now spread to his brain, AP notes. Carter also said that the treatment for his illness would force him to cut back on his normal routine. The King family, however, hopes that his involvement will help resolve the matter. In a joint statement released by the family, they noted that they are "truly honored and encouraged by President Carter's involvement," and that they "look forward to a positive resolution."